Nick Foles - Bio, Wife, Daughter, Net Worth, Family, Is He A Christian? 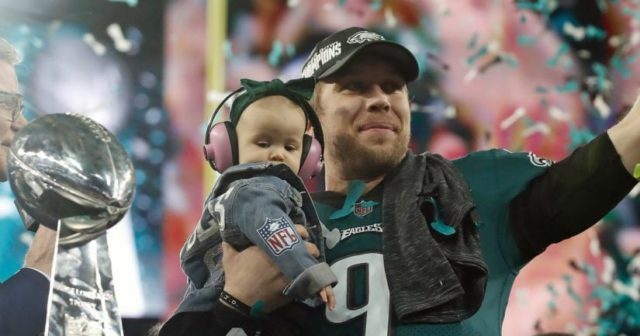 Home Sports Nick Foles Wife, Daughter, Net Worth, Family, Is He A Christian? Nick Foles is a decorated NFL player who led the Philadelphia Eagles to a dramatic win at the Super Bowl LII. The quarterback who is a native of Austin, Texas, is the son of a successful entrepreneur Larry Foles and his beautiful wife, Melissa Foles. The couple run chain of restaurants in Austin, Texas and also in major cities across the United States. Foles was born on the 20th of January 1989 in Austin, Texas and raised in the same town, alongside his two sisters, Katie and Lacey Foles. Rather than follow in his parents’ line of business, Nick chose to pursue his love and passion for the game of football and his parents didn’t stop him, rather they gave him all the support he needs. He attended Westlake High School, where he graduated from in 2007. In high school, Nick played both football and basketball. During his two seasons with the school football’s team as a starter, Nick Foles broke most high school’s record previously held by Drew Brees after he threw for 5,658 yards with fifty-six touchdowns. His high school teammates are Justin Tucker and Kyle Adams. He also played basketball and was good at it too. As a basketball player, Nick started for three years and earned the team’s MVP honors twice. He was later recruited to play for Texas, Baylor, and Georgetown even as a high school student. Towards the end of his high school career, Nick committed himself to play football for Arizona State but would later change his mind and decided to go to Michigan State. He would later transfer to the University of Arizona where he bagged a degree in communication. After just one game with the Michigan State Spartans, where he completed five of eight passes for fifty-seven yards, he transferred to Arizona and was redshirted for the entire 2008 season as a freshman. Foles would compete for Willie Tuitama’s position with Matt Scott after the former graduated. The coaches felt Scout would do a better job as Tuitama’s successor and he did try his best in the games against Northern Arizona and Central Michigan but struggled against Iowa and had to be replaced with Nick Foles who stepped into his shoes and led the Wildcats to a victory against Oregon State. Nick started the games for rest of the season and completed two hundred and sixty of four hundred and nine pass attempts for 2,486 yards, nineteen touchdowns, and 9 interceptions. The next season (2010), he started all of the games as a redshirt junior. He led the team to a 7–1 start; this includes a win against #9 Iowa which was aired on national TV. He also led to a game-winning drive that ended with one touchdown pass. In a game against the Washington State, Nick sustained a knee injury that kept him on the bench for 2 games, in spite of the injury, he still ended his junior season with 3,191 yards, 20 touchdowns, and 10 interceptions. During his last season with the Wildcats, Foles completed 387 passes for 4,334 yards and 28 touchdowns. That year, he was named the #1 in the Pac-12 Conference and with an average of 352.58 yards of total offense per game, he was ranked 5th among all NCAA Division I FBS players. He was also ranked #20 among all FBS players in total passing yardage and #2 in the Pac-12. After his college career, Nick entered for the 2012 NFL Draft and was selected by the Philadelphia Eagles as the 88th overall pick in the 3rd round of the Draft. In May, he signed a 4-year deal with the franchise. He would make his first career in a week eleven game against the Washington Redskins. Although the Eagles lost to the Redskins, Foles was responsible for 21 for 47 in passing 204 yards, with no interceptions and touchdowns. In December, he recorded his first win as a starter in the game against the Tampa Bay Buccaneers which ended in a 23–21 win. After three seasons with the Eagles, he was traded to the St. Louis Rams alongside a 2015 4th round pick and a 2016 2nd round pick in exchange for Sam Bradford and a 2015 5th round pick. In August 2016, he signed a one year deal with the Kansas City Chiefs worth $1.75 million; the contract, however, included a 2nd-year option worth between $6.75 million and $16 million. But the second-year option would depend on his performance in the 2016 season. After the 2016 season, the franchise didn’t activate the 2nd option on his contract, thus, making him a free agent. That same month Nick Foles returned to the Eagles on a two-year contract to back up their 2016 1st-round pick Carson Wentz. In 2018, he led the Philadelphia Eagles to a dramatic win at the Super Bowl LII and has remained with the team till date. Despite his parents’ wealth, Foles accrued his net worth solely from his career as an NFL player. Some sources, however, suggest the QB’ net worth is more than the given figure while others maintain he earns less, however, from our calculations, his net worth is currently around $6 million. Foles has been happily married to wife, Tori Moore since 2014. Tori is a former volleyball player and a sister of Evan Moore, a former NFL tight end and Nick’s teammate briefly in 2012 when he (Moore) played with Philadelphia Eagles. Nick and Tori met at Arizona as students. The couple welcomed a beautiful daughter named Lily James in 2017. They currently reside their own house in Haddonfield, located in Camden County, in Southern New Jersey. Nick Foles is not just a professing Christian but also a practicing one. He is very vocal about his belief in Jesus Christ and desires to become a preacher after retiring from his football career. He recently revealed that he signed up for classes at a seminary; he, however, revealed that combining that with his current career has been very challenging since it involves writing biblically correct papers.